At this time of year in Fallingbrook, Wisconsin, I'm arriving at work before dawn and leaving at twilight. I'm lucky that I live only about ten blocks from the donut shop, Deputy Donut, that I own with my father-in-law. My cat, whose name is also Deputy Donut, Dep for short, comes with me. In good weather, she wears a harness and leash and we walk. In cold weather, I tuck her into a specially made pouch that I wear inside my warmest parka. Yes, there is some complaining about the indignity of it all at first, but as I walk to work, I often feel the vibration of her purrs. We help each other stay warm. Dep spends her days in our office in Deputy Donut, a room that is also fitted out as a kitty playground. She is cheerful, our cafe is cheerful, and our customers are cheerful. And it's not wonder! They are drinking some of the best coffee and eating some of the best donuts anywhere. Okay, you're right. I could be biased. My father-in-law Tom is usually cheerful, too, but now that the holidays are over, I caught him frowning down at the donuts he was frying. "You need a vacation," I said. "Somewhere warm and sunny." "Maybe next winter, after we hire and train an assistant." 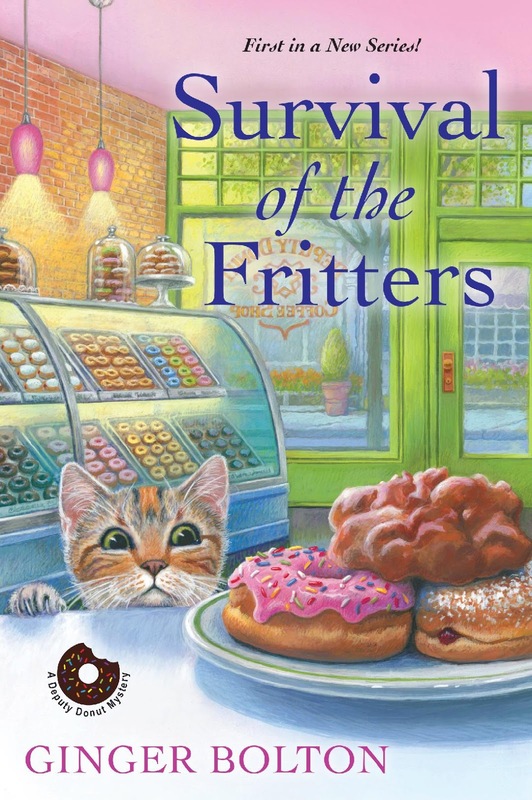 It was a sunny day, and although the actual sunbeams don't reach into Deputy Donut on winter days, it was bright inside. "Tell you what," I said. "It's not crazy busy here in the winter. Why don't we each take at least a half hour in the lightest part of the day to get some exercise outside?" He tilted his head. "Good idea. You go first." How like him . . .
And that's why the citizens of Fallingbrook will often see Tom or me striding around downtown Fallingbrook around noon. They might even hear a "meow" coming from deep inside my parka. Or a furry little face with a cute orange stripy patch on the forehead peeking out above the parka's zipper. 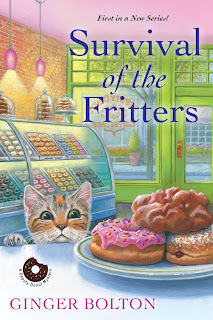 To learn how Emily, often with the help of Tom, retired Fallingbrook Police Chief, solves murders, check out the Deputy Donut Mysteries, SURVIVAL OF THE FRITTERS and GOODBYE CRULLER WORLD. 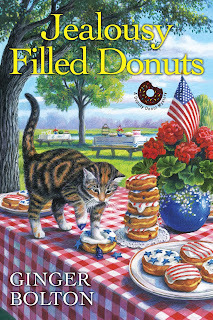 JEALOUSY FILLED DONUTS comes out August 27, 2019, and is now available for preorder. Giveaway! In the comments below, tell us what you do to cheer yourself during the shortest, darkest days of the year. 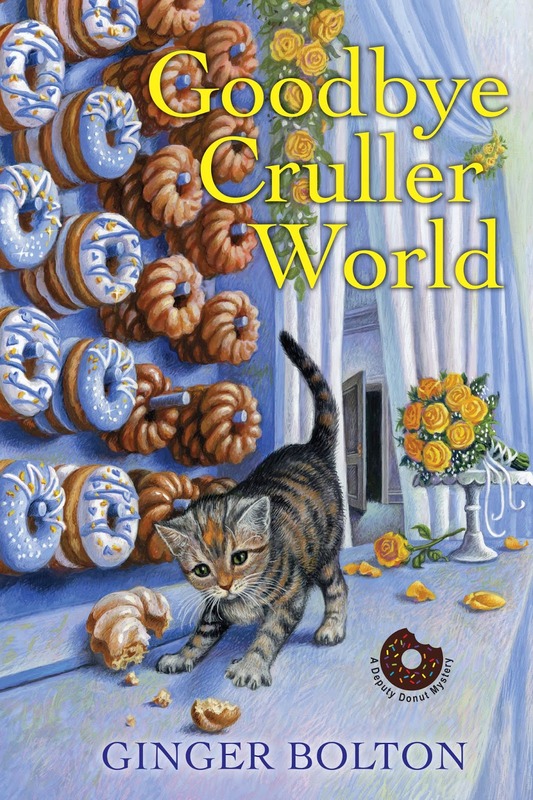 One commenter, chosen by a random number, will win a copy of GOODBYE CRULLER WORLD. Reading and knitting are cure alls for me. A movie musical - with lots of happy music.Especially Singing in the Rain or others from that era Cheers (at) MarjimManor (dot) com. I like to sit in front of a sunny window, with my eyes closed, and feel the warmth of the sun on my face! Thank you for giving away the book. I love this series! My grandson always cheers me up. He is 18 months. I read, clean out closets and drawers, and volunteer at the school where I retired. Fortunately we live on a small acreage outside of town in the Ozark Mountains. We have LOTS of daily critter visitors (deer, raccoons, squirrels, eagles, birds of all sorts, rabbits, chipmunks to name a few) that come to entertain us. Lots of them come up real close to the French doors so we can sit at the dining table and enjoy their antics. When I'm feeling blue from the short hours of daylight during the winter months that are often dark and dreary, I find that either watching or photographing our critters can lift my spirits even into the evening hours thanks to the big yard lights. When there are no critters to entertain us, I love to curl up by one of the two fireplaces in our home. When we found this property to build on, there were two 1853 large stone fireplaces still standing from the old homestead. We built our home around those fireplaces placing one in the living room and one in the bedroom. We had a local artisan make us two 300+ pound solid oak mantles with hand hammered support brackets. Love to have the fireplace going and while watching the flames envision to original settlers seating by this same fireplace. Nothing beats a warm fireplace, a great book and having the love of your life (mine is my amazing husband of 36+ years) beside you to make you feel all warm inside enough to shed off the doom and gloom of the dark days. 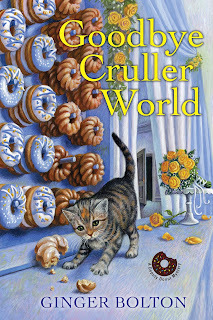 Thank you for the fabulous chance to win a copy of "GOODBYE CRULLER WORLD"! I watch lots of basketball, read, eat too much, and snuggle with my dogs and husband. Actually I enjoy winters. We get quite a few gray days in the winter. I turn on lots of lights and read a good book with a cup of coffee and a cat to keep me company. I read a book by the fireplace! I either curl up with a good book or take my pup on a walk. Thanks for the chance. I should go for a brisk walk! Add in a sweet kitty and I'd be all set. I bake on days that are long. I always try new recipes on these days. Some are tasty and some I will not use again. I like to make soup or bake something and then curl up with a good mystery. I hang out with my little dog and watch movies or read books. Thank you all for your fun and useful replies. The random number generator chose anajs95. Congratulations!